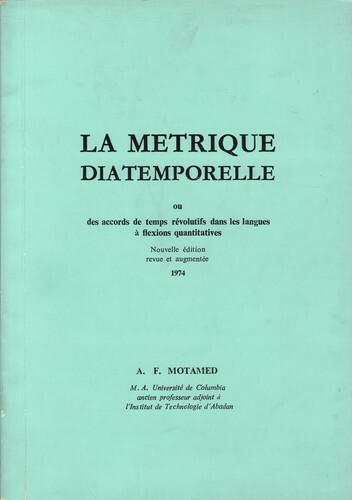 1 edition of La métrique diatemporelle found in the catalog. Add another edition? Are you sure you want to remove La métrique diatemporelle from your list? Published 24 February 1974 by Imprime sur les presses du Ministere de l'Information in Tehran, Iran . This book is quantitative poetic metric analysis and pursuit of reasoning on aesthetics of linguistics and poetry in Indo-European languages. 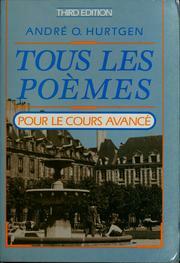 Although this book was published in 1974, it never got distributed to the public. Now available in digital form for scholars interested in the science of meter and its relation to poetry and languages. 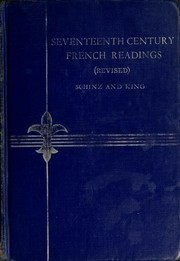 The book is written in French and it is a result of 41 years of research in pursuit of perfection for delivering a universal formula that defines beauty in spoken Indo-European words. This is the third book from A. F. Motamed, published in 1974 (Depot Legal 1903, 20 March 1974), where he takes his study and analysis of aesthetics of linguistics and poetry in Indo-European languages to a new level. This edition is a richer study and analysis of quantitative Meter (poetry), the measured characteristic movement of a verse, of the Indo-European languages. The earlier editions were: Logistique de l'harmonie métrique, Tehran, Iran. 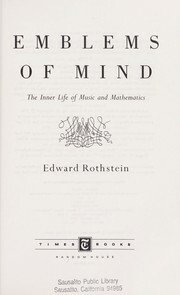 A complement on the scientific aspects of temporal proportions viewed as harmonic rings and sets, Depósito legal 183, 1963. 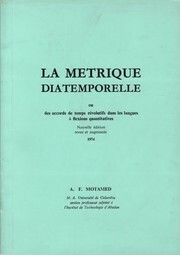 De la Métrique: Motamed, Amir Ferydoun. De la metrique, ou des accords des temps révolutifs dans les langues guantitativement flexionnelles — Téhran : Khoushé, 1962 . — 133 p. ; 24 cm. Solicitar por: 801.6 M 917. Using metrics analysis, this book studies and analyzes aesthetics of linguistics and poetry in Indo-European languages, Depósito legal 166, 1962. October 20, 2014 Edited by Daniel Motamed Edited without comment. October 19, 2014 Edited by Daniel Motamed Removed repetitive title. Added reference to prequel. October 19, 2014 Edited by Daniel Motamed Original contribution. October 19, 2014 Created by Daniel Motamed Added new book.